"Either watching football or spending time with my partner, usually walking her dog!" "A Caribbean cruise I went on when I was younger, visiting Jamaica, Dominican Republic, Haiti and southern Mexico. If you ever get a chance, I highly recommend going to Labadee in Haiti - absolutely breath-taking." "This changes every week or so as I do hop from genre to genre very easily, however, my all-time favourite song is ‘Riders on the Storm’ by The Doors." "James Bond, of course. What a life to live!" "Drinking copious amounts of coffee.”"
"Anything with chocolate in or anything related to chocolate - preferably 100% chocolate.”"
"A sense of humour is an absolute must. I like people who look you in the eye when you have a conversation, and I also prefer people to be down to earth as I find arrogance a bit unnecessary." "Mobile phones at the dinner table, or just phones in general. I’m part of a generation that’s just glued to them and I don’t like the effects they have on some people and what it’s doing to society." "My dad brought me back a US Army UBAC (combat shirt to wear under armour) from Afghanistan when he fought over there. The British and Americans swap shirts after operations, so was nice to have something that meant a lot to him and has a history behind it. Plus it makes you feel like Action Man for a bit!" "Thierry Henry, Jim Morrison and Lana Del Rey." "The morning coffee, lunch time catch-up on the phone to my partner and polite people on the phone!" 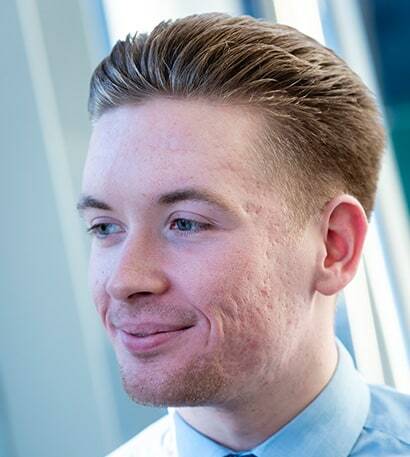 Leon joined PenLife in 2015 and has since completed an advanced apprenticeship. Today he is Dedicated Support to Asif and his clients. Leon provides general support and paraplanning to help Asif with his recommendations. He also provides support to our compliance team to make sure our paperwork and processes are up to date with the latest legal developments. Leon also chairs the investment committee meetings for our portfolios. Leon’s main interest is football; he’s a keen supporter of Grimsby Town and Arsenal, having spent much of his childhood in these two places. He also enjoys spending time with his friends and his partner.